We warmly invite you to join a lecture with the president of World Business Council For Sustainable Development (WBCSD) Peter Bakker. 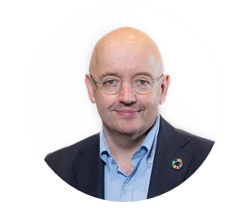 Peter Bakker is a Dutch entrepreneur and a current president of World Business Council For Sustainable Development, also a renowned leader in the sphere of corporate responsibility. He is a holder of prestigious awards such as Clinton Global Citizen Award (2009), Sustainability Leadership Award (2010) and Ambassador Against Hunger: UN World Food Programme in 2011. Peter Bakker also presides War Child Netherlands organization. WBCSD – World Business Council For Sustainable Development is a global, CEO-led organization of over 200 leading businesses working together to accelerate the transition to a sustainable world. Its mission is to accelerate the transition to a sustainable world by making more sustainable businesses more successful. WBCSD helps make its member companies more successful and sustainable by focusing on the maximum positive impact for shareholders, the environment and societies. With the headquarters in Geneva, Switzerland, WBCSD operates through its Global Network of almost 70 national business councils which allows it to give its members unparalleled reach across the globe.